What place does disability have in the training of a manager or leader? The GEM Alumni Relations Team is coming to you to present a new online training program: the Disability Management Certificate. Managers play a key role in the integration of disabled colleagues. Managers must follow specific legislation for disable persons when working at a company with more than 20 employees. Managers have to realize recruitment is not the only tool at their disposal to encourage disabled persons. Managers will successfully integrate disabled co-workers when they see beyond physical installations. A disability is more than just a wheelchair. Managers also have to accept that a disability is something that can happen to any of us. In France, legal requirements give companies strong incentives, and sometimes even force them, to evolve their habits vis-à-vis the recruitment of disabled persons. In addition to these obligations, integrating persons with disabilities fits in with a wider strategy to encourage diversity in company employment. As a consequence, such actions must be seen as an integral part of HR strategy and social responsibility. To guarantee the successful integration of disabled persons in professional life, companies also have to focus on overcoming employee prejudices against disabled workers. Numerous tools, means of communication and training are available to successfully navigate these challenges. The manager, defined as a team leader, plays an essential role in the integration of disabled persons. However, training is the key to unlocking a manager's ability to overcome this challenge. The Disability Management Certificate aims to train managers and give them the tools to integrate disabled workers in their team. help disabled employees carry out their work with the least constraints. 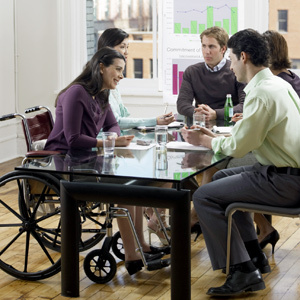 be a key player in the implementation of a company's policy on disabled employees. Sylviane Chabli or Laetitia Czapski.